"Words make you think thoughts. Two songs have shaped the modern era in ways reminiscent of apocalyptic hopes. They form out of the human desire for a better place, a better time, as the Depression, the War, and the Shoah, as well as the Cold War cast a pall over Western Culture. The early Jews, not only those who composed the Books of Enoch, the Testaments of the 12 Patriarchs, 4 Ezra, 2 Baruch, and the History of the Rechabites (each is translated in the Old Testament Pseudepigrapha), dreamed of a place where there are no enemies, no conquering armies, and no cold or icy earth. Food with drink is abundant beneath a warming sun. First, the song “When You Wish Upon a Star” was written by Academy-winning composer, conductor, arranger, and songwriter Leigh Adrian Harline (1907-1969) and Academy-winner Ned Washington (1901-1976) for Walt Disney's 1940 adaptation of Pinocchio. Cliff Edwards sang the original version and the character on the screen was Jiminy Cricket. Second, and far more importantly, the song “Over the Rainbow” was written by E. Y. Harburg (1896-1981) with Harold Arlen (1905-1986) in 1938. It was featured in the 1939 movie,The Wizard of Oz, and first sung during filming by the incomparable Judy Garland in 1938. “Over the Rainbow” is first on the “Songs of the Century” list compiled by the Recording Industry Association of America and the National Endowment for the Arts and ranked the greatest movie song of all time on the list of The American Film Institute’s "100 Years...100 Songs.” It was adopted by American troops in Europe in World War II as a symbol of the United States. Garland herself performed the song for the troops as part of a 1943 performance. Most importantly for us, the stirring lyrics of this song were composed by two Jews. Harburg was Edgar Yipsel. He was nicknamed “Yip,” (most likely, as he himself stated, the Yiddish word for “squirrel” [yipsi]) and was Jewish and born Isidore Hochberg, Yiddish: He was born in the Lower East Side of New York City, in the Jewish ghetto of Manhattan. His parents were Yiddish-speaking Orthodox Jews. They immigrated to the USA from Russia. Harold Arlen was also Jewish. He was born in Buffalo, New York and named Hymen Arluck. His father was a synagogue cantor. By about seven he began singing in his family’s synagogue. At 15 years of age he fled high school for New York City. His career included successes as a pianist, singer, and prolific composer. After a short time with a dance band, he wrote his first hit: “Get Happy.” Arlen composed more important and influential songs than any other composer in American history. Over the Rainbow (Academy Award, 1939). Notice how many of these well-known songs were immortalized by singers such as Frank Sinatra, Ella Fitzgerald, Dean Martin, Lena Horne, and other gifted and memorable singers. Observe how they embody the hope of another place where our dreams are realized. These songs were selected because they mirror the apocalyptic hope that shapes our culture and our lives. Yip referred to “our tribe;” it included Cole Porter, Ira Gershwin, Lorenz Hart, and Howard Dietz. They met weekly at George Gershwin's home. [“Democracy Now article 25, November, 2004,” Democracynow.org. Retrieved July 31, 2012]. 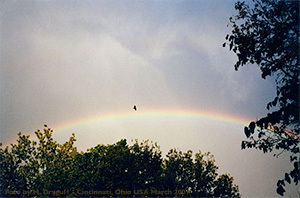 It is certain that the song “Over the Rainbow” was intended to have political significance. Harburg expressed hope that we Americans would recover from the Great Depression. Dorothy’s Kansas lament embodied the horrors of the Dust Bowl. This ecological disaster and human tragedy was caused by overworking the open plains in and near Kansas. Some of the farmers fled the strong winds and tornadoes of Kansas for life in sunny California where the song was taking shape. Note how many songs listed above were jointly composed by two Jews. And how did ancient Jewish apocalyptic eschatology inform modern lyrics and hopes? As we answer this question let us not forget that for biblical thought and imagination “hope” is not uncertainty as in some modern cultures; it is something definite and real based on God’s promises found in his Word or Torah, the Bible. Life after Auschwitz can never be the same as before it; and that is true in all lands and not only in the land of Bach, Brahms, and Beethoven. We know that “chimney tops” have a meaning now that they may not have had in the minds of Jews who composed “Over the Rainbow.” One year after they composed the song, each of the composers would have imagined they were prescient when they used the word “chimney tops.” For us who remember the poignant, disturbing movie “Schindler’s List,” in 1993 or in a more recent rerun, something too horrible to explain appears evident as we remember the smoke billowing from the chimneys of Auschwitz-Birkenau and a fleshy-white substance filtering downward. Our gnawing question about prescience in the mind of Harburg and Arlen may remain without any firm answer. We may never know. But, we should ask and ponder: Who are we? What has shaped our minds and hopes? To what extent are we humans thinkers with dreams developed out of early Jewish apocalyptic eschatology?